Toss strawberries with 1 tsp. sugar and orange juice. Refrigerate until ready to use, stirring occasionally. Drop dough into 16 mounds, 2 inches apart, onto parchment-covered baking sheet, using 1 heaping Tbsp. dough for each. Flatten slightly with back of spoon; brush with remaining milk. Bake 10 to 12 min. or until edges of shortcakes are golden brown and toothpick inserted in centres comes out clean. Transfer shortcakes to wire rack; cool slightly. 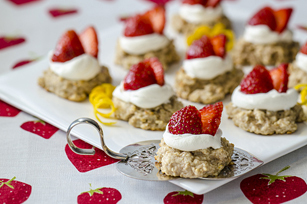 Serve shortcakes topped with Cool Whip and strawberries. Prepare as directed, using lemon zest and juice, and/or substituting fresh blueberries or raspberries for the strawberries. For best results, prepare using cold cream cheese product and margarine. Since this great-tasting dessert is made with better-for-you products, it can fit into a healthful eating plan.